Remember how happy you were when you found out that Battlefield: Bad Company 2 is going to support dedicated servers? Get ready to kiss that pleasant feeling goodbye, because today we're going to learn about the DRM. 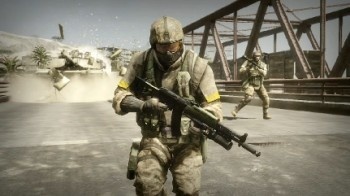 Battlefield: Bad Company 2 scored some major PR points when it was discovered that Activision's Modern Warfare 2 would eschew dedicated server support, for years a standard component of online shooters on PCs, in favor of "console style" peer-to-peer matchmaking. EA DICE made a point of emphasizing that it wouldn't abandon its faithful core of PC supporters and even posted a "Dedicated Server FAQ" on the Bad Company 2 website, "dedicated to our PC players." DICE will no doubt lose some of that goodwill, however, after today's update regarding the Bad Company 2 DRM. The short version: It's SecuROM. It's not the most intrusive, install-limiting version of the infamous copy protection software possible, but the name itself will probably be enough to put off a lot of potential buyers. "The version which we use is a wrapper around the main game executable. It does everything it can by running as a 'normal' program; it does not install any sort of kernel software," explained Mikael Kalms, the lead programmer on the PC version of the game. "What this means is: No software is permanently installed on your machine, SecuROM is ONLY running when the game is running [and] when you uninstall the game, you will also uninstall the SecuROM software." Owners will have two options to authenticate the game after it's installed: By putting the DVD in the drive for a disc check, or going online. With the disc in the drive, neither SecuROM nor the game will go online at all, so an internet connection will not be required in single player mode. Digital versions of the game will be required to authenticate online, obviously, but regardless of the version, the online check will only need to be done once: DICE has programmed the authentication to be valid for 10,000 days, meaning that a validation made on launch day (March 2, 2010) will be valid until July 18, 2037. It sounds pretty reasonable to me. It's a complete waste of time, of course; there's probably even odds that the game will be cracked and available on torrents days before it hits store shelves. But if there's going to be DRM, this seems like a fairly reasonable approach: No internet connection required, an authentication that's good for three decades and no messy SecuROM extras hiding on your hard drive. Obviously some people won't be happy with that - SecuROM is SecuROM, after all - but at least it sounds like DICE is doing its best to ensure that the time its wasting on copy protection schemes isn't going to inconvenience people any more than necessary.